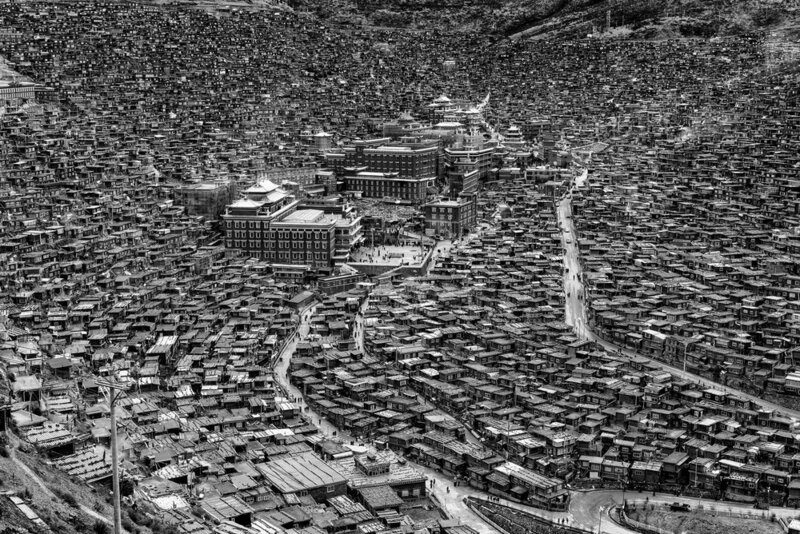 The world's largest center for Tibetan Buddhist study. The University has recently come under the intense scrutiny of the Chinese Govt. which has imposed mass evictions and demolitions to lower the population of the remote valley. Domiciles near the University awake with fires after a cold night in the valley, which sits at 13,000 ft.
At the base of the valley, one catches their first glimpse of the vast and unique architecture of Larung Gar. A large mosaic composite of around 35 individual images attempts to convey the grandeur and scale of the architecture within the valley. 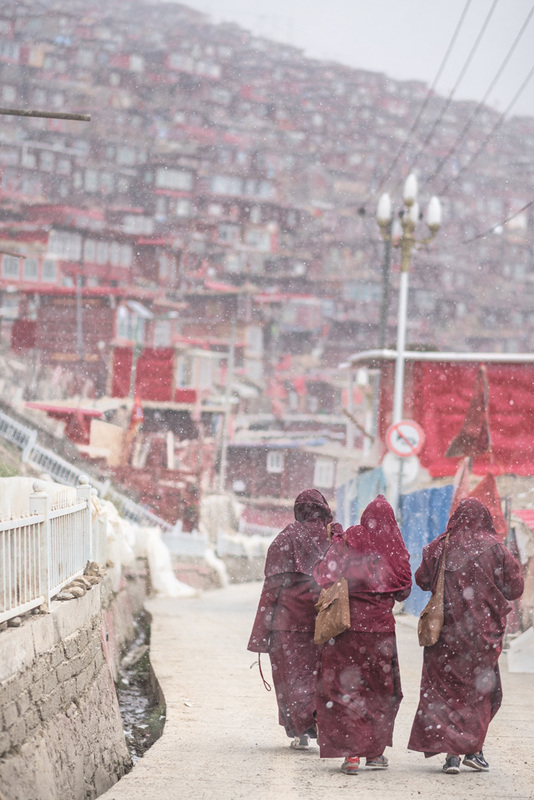 A group of young monks walks through the valley. Most groups were unwilling to be photographed, although these three were more than happy to pose for the camera. Note the smartphone and modern sneakers. 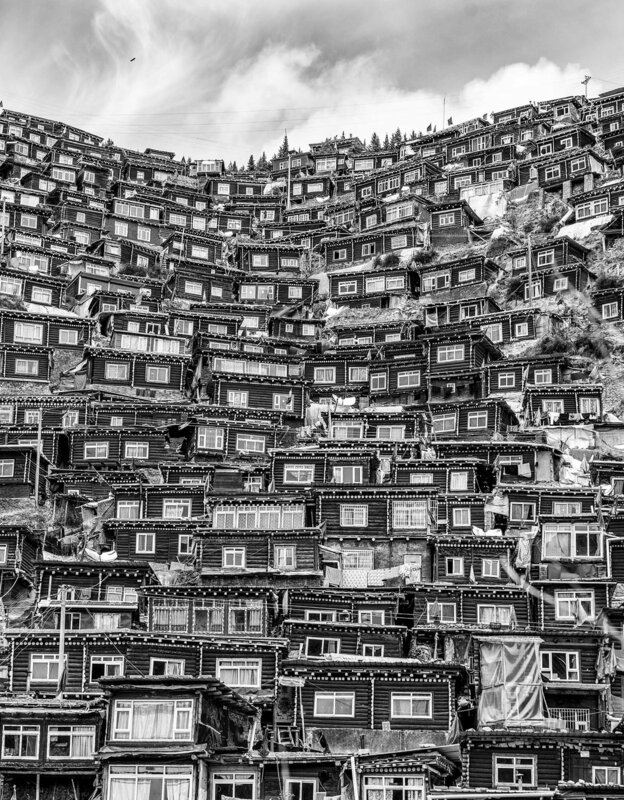 Nearly every resident of Larung Gar owns a smartphone. The main road through Larung Gar sees mostly foot traffic, with the odd tractor and SUV carrying high Lamas or wealthy Chinese tourists. An overview of the densely packed settlement, with the University at center, and the Golden Stupa top left. The weather ranges from pleasant in Spring and Summer, to extremely cold and inhospitable in Winter. Here, monks shield themselves from a dust storm sweeping the valley on a frigid day. The massive golden prayer wheel is enveloped by ceremonial incense smoke in the morning sunlight. The main University structure is quite large. In the foreground, the founder Jigme Phuntsok (left) and current leader Tsultrim Lodro (right) are pictured. A group of young devotees make their way through the valley to their classes for the day. The Valley of Larung Gar is quite remote, being over 20 hours by car from the major Chinese city of Chengdu.. The area surrounding the valley is a vast grassland of rolling hills and small Tibetan villages. Larung Gar welcomes large numbers of Tibetan pilgrims who come to visit, study and pay respects in the sacred valley. 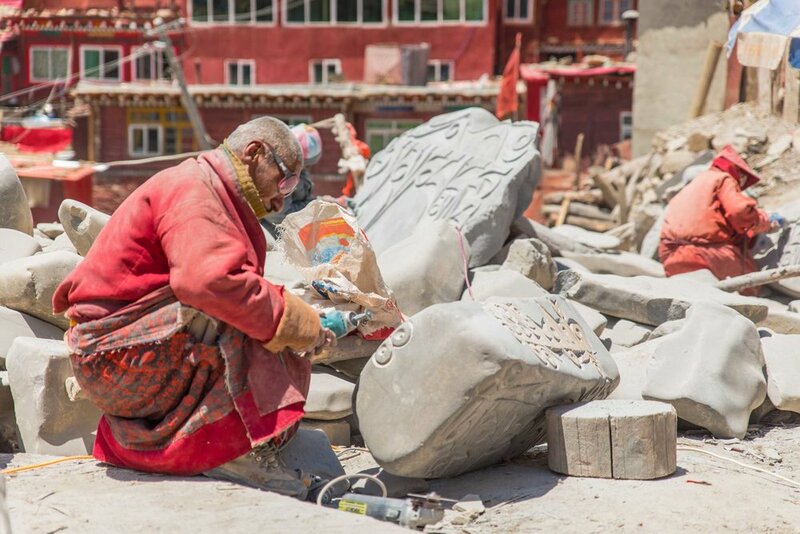 Due to its remoteness, Larung Gar must receive shipments of goods to feed and clothe the large number of students and residents. Here, a delivery truck sheds its payload. Large Brown Vultures, participants in a funeral rite practiced in remote parts of Tibet. The deceased are placed on a hilltop, where their corpse is consumed by the vultures, and returned to the land from which it came. A Monk pays respects to the deceased during a sky burial ritual. The scalps and hair of the deceased adorn an ornate structure. The staggering architecture of individual wooden homes seems overwhelming when viewed from the base of the valley. Over the hill from Larung Gar Valley, the scene becomes much more pastoral and typical for this region of Eastern Tibet. The main Golden Stupa sits below a single cloud. The Stupa serves as a meeting place as well as a holy building where devotees perform 'Kora' or ritual circumambulation of the structure. The stupa seems to rest atop a tower of wooden homes. A layer of icy fog hangs over the dwellings. All heating is produced by burning coal or manure in the small homes. Construction workers build a new home towards the top of the valley. Unfortunately, new construction has been halted, and many homes demolished since the Chinese Govt. crackdown. 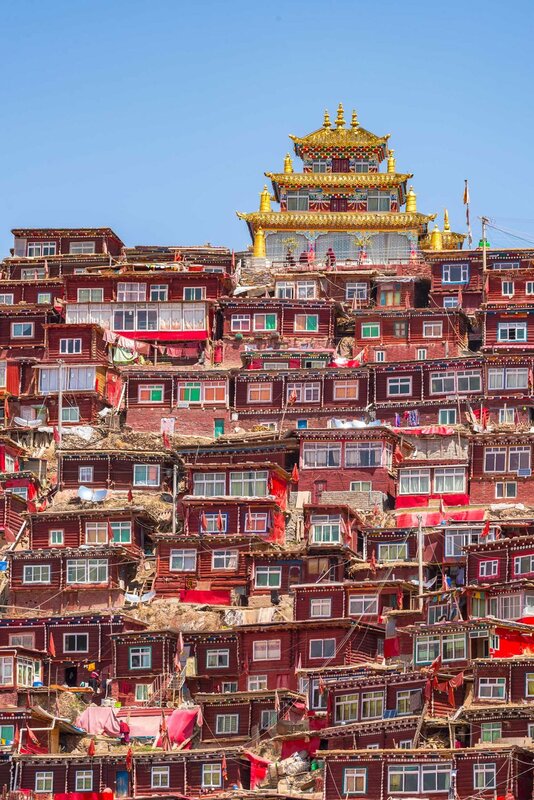 A sweeping view highlights the dwellings of Larung Gar. A young Lama, whom the photographer befriended, laughs as language barriers are slowly broken down. A sight that cannot be conveyed without experiencing it. A group of young nuns takes a selfie on a hillside covered in colorful prayer flags. A group of nuns walk with books and bookbags to class on a snowy day. 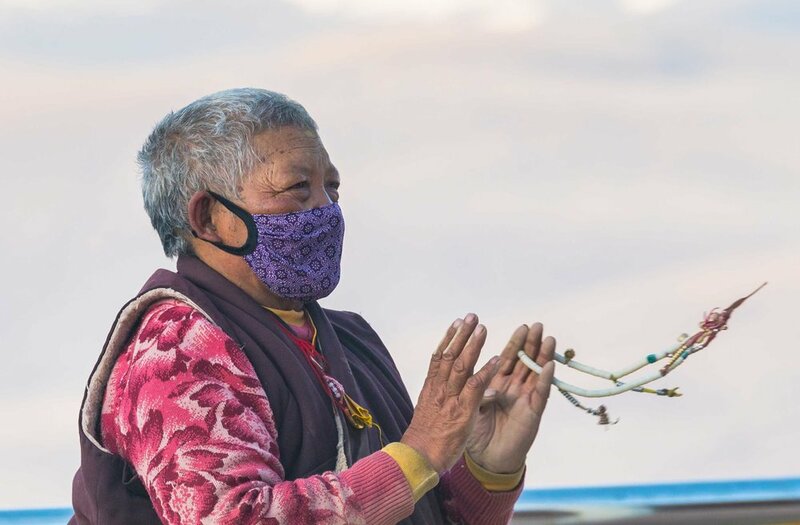 An elderly devotee prays at the stupa atop the Larung Gar Valley. The Mala beads in her hand are used to rhythmically recite prayer.